This is a PERFECT illustration of my photography woes. It was one of THOSE days – get kids off to school, climb around in dusty attic, tackle piles of laundry, pick up 4-year-old, get treats at Korean bakery, read stories to 4-year-old for 45 minutes, pick up 8-year-old, stop by fish and chip shop for dinner, realize you need a photo of yourself for your blog, ask 8-year-old to oblige, go home, collapse. You’ll notice he managed to get a finger in BOTH photos. The first thing I notice about this ensemble is that I’m now too pudgy to properly button my beloved yellow coat (and that it could use an ironing). Note to self: only button the waist button or leave it open. This is a really good trick if the coat is just sliiiiightly too tight. You can also leave the coat open but add a belt – remember when Michelle Obama did this on O magazine with a cardigan? Define your waist with a belt – even if you’re too big to close the jacket! What I’m hoping YOU will notice in my photo is how nice the colors look together. This is a good illustration of my “rule of threes“: no prints or patterns, no obvious textures, 3 bright colors. The green is repeated in my ring, earrings, and necklace. The grey boots and tights are neutral and don’t count. If you’re bewildered by the combination of yellow, red, and green, think about a fruit bowl with yellow bananas, green apples, and red cherries. Of course I didn’t plan it that way (although I could have) – this just happened to be the bag I’m using at the moment, and the yellow coat was by the door because I haven’t put it away for the winter yet. But having that image in mind DID give me the confidence to throw those colors together at the last moment. I’m wearing my grey rain boots, which I love. There’s a bit of a moral behind those – I wanted something vinyl or rubber for the great British weather, but which looked nicer than wellies. I was hunting around various websites and found these on YOOX.com. They were marked down from £100 to £40, but only available in grey. It wasn’t what I’d wanted, but I decided to give them a try. I have to say, I’m amazed at how much I wear them. They go with almost everything, and are much more interesting than boring black. The moral of this story is that sometimes the thing you need is something you wouldn’t have chosen. You have to keep an open mind. 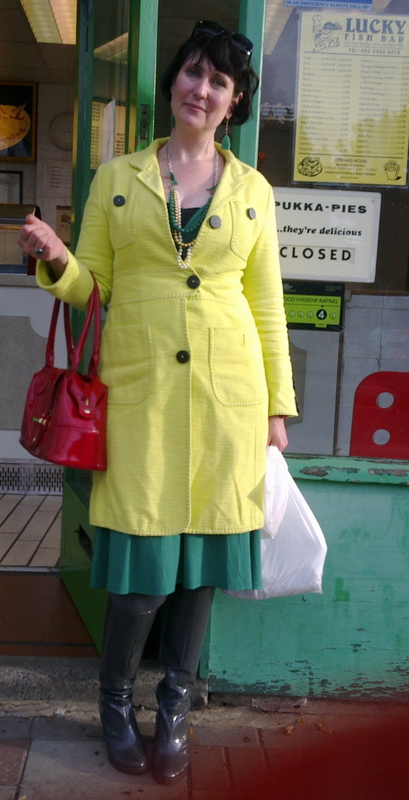 I’m also wearing my yellow Betty Barclay coat (yet again), another eBay steal. Most people are afraid of bright colors, so eBay is an excellent place to look for things like this. You’re not going to get a lot of bidding competition. The green jersey dress is a more recent eBay acquisition – one size up from my usual size, but guilt-free. For £7 (including shipping!) I don’t care if I only wear it for one season. Of course I’m wearing a black vintage slip underneath to avoid showing mounds of cleavage in the schoolyard. The red handbag is by LK Bennett, purchased at one of their outlet shops. I like patent leather because it holds its shape and wipes clean with baby wipes. If you have children you know why this is important… and why I always have baby wipes with me. Finally, the jewellery was made by me. I’ve been reworking vintage bits into new pieces for over 10 years now. The necklace is a recent experiment, combining two colors of vintage pearls with 1930′s jadeite beads. I’ve tried to modernize it with bright green ribbon and a silver chain. 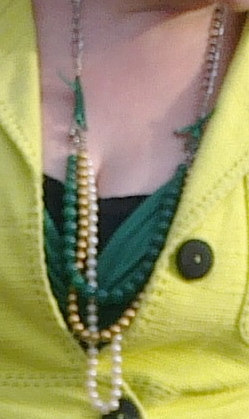 You can’t see it from the photo, but the beads are connected with the two halves of a green iridescent vintage clasp. The jury is still out whether this piece is successful, but I have to say the beads bounced around very nicely over my humps. I’m considering doing the occasional jewellery tutorial with ideas and instructions for making basic alterations and repairs. If this sort of thing would interest you as a reader, let me know and I’ll do it sooner rather than later! I miss you! Come back to posting! Aw, it’s nice to be missed. Your wish is my command! Just posted now. Expect lots of new stuff in the coming weeks.